After so much death and destruction, Allied Forces must have been truly reeling by 1 August 1918. Yet, though they had suffered so many defeats, the Germans had not been victorious, Paris was safe and the attacks had petered out. So now was the time for a counter attack – and it started on 8 August 1918 and it gradually pushed the Germans back over the next three months. Many historians today regard this campaign as the most successful in British military history. Yet Tewkesbury still lost 16 more of its sons, 5 of them from the 1st Gloucesters which had been fighting since the beginning of the war in France. This campaign, as with the March German attack, was a series of co-ordinated battles, conducted consecutively all the way along the line by the Allies that gradually forced the German Army to retreat to the point where the civilian politicians had to step in and halt the bloodshed. The allies now appointed Marshal Foch as Allied Supreme Commander; he was keen to expel the invader and was further buoyed by the effective build-up of US military power, as well as British reinforcements as victorious troops from Palestine and Italy were gradually returned to this theatre. In addition, reserves which had been – allegedly – held back by Lloyd George were sent to France. The fear created by the German attack in April 1918 had induced the Government to amend the Conscription Act for the fifth time – in order to include men from 17 to 51 (instead of 41). Foch accepted Haig’s proposal to attack for a second time on the Somme: many of those costly gains in 1916 had been lost earlier in 1918. However, it proved suitable ground for the use of the revolutionary tanks. The Germans were also weaker in this area because of successful Australian inspired tactics of “peaceful penetration” – raiding parties to perturb the enemy. And the Americans were arriving in strength! 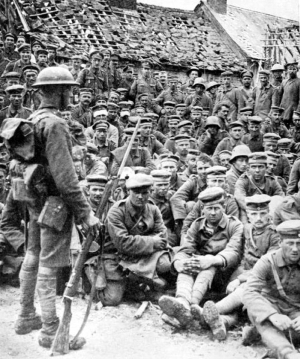 For once on 8 August 1918 the lone guard of the masses of POWS was a British Tommy!